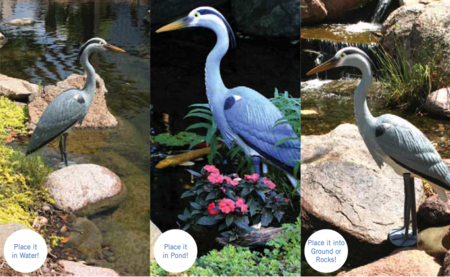 Aquascape's Standing Heron Decoy deters herons from coming to your pond by making them think another heron is already there. Very realistic standing heron, stands 29" tall. Aquascape's Standing Heron Decoy deters herons from coming to your pond by making them think another heron is already there. Very realistic standing heron, stands 29" tall. Can be placed in water, in the ground, or near rocks. The flat base allows it to be placed into a liner pond. Just cover the base with some rock to add extra stability. From DONALD MOORE of MILFORD, Connecticut on 6/12/2014 .